The question or search of how to clean slate floor is a popular one. 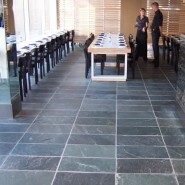 There are many homes and commercial buildings that have slate floors installed. Slate is a wonderful stone floor that comes in a variety of colors. It gives a room or building a rich look. There are also many ways to clean slate floors. Most of these methods will provide good results. Mop and bucket, flat mop, specialty cleaning floor products, etc. For the purpose and objective of this article we will be addressing the residential home market and discussing the option of using a Steam Floor Mop to clean slate floors. We will explain the advantages of using a steam floor mop to cleaning slate floors but also will discuss and advise why using a steam mop is a viable alternative to cleaning with a standard wet mop. There are many reasons to sue a steam floor mop to clean slate floors but the primary reason is because they work. Slate has basically two different types of surfaces; smooth and split. The smooth surface is exactly what it says. The split surface is a rough uneven surface. A steam floor mop will clean well and deliver positive results on both surfaces. In fact a steam floor mop actually performs better than other standard methods to cleaning a split slate floor. This because the steam mop combined with the microfiber pads they use can penetrate the soils trapped in the rough surface whereas other mopping methods can glide over the high spots of the uneven rough slate surface. Steam cleaning provides a form of floor cleaning that works well. The following is a brief list of the advantages of using a steam floor mop to clean slate floors. Steam floor mops are a green and environmental way to clean slate floors. They use only water that converts into steam to clean the floor. Additionally because it uses steam to clean, the steam floor mop uses less water to clean slate floors. This also makes it a green way to clean slate floors. There is a cost savings with steam floor mops because they do not require a cleaning product or detergent to clean the slate floor. So the homeowner can save money on floor cleaners.